Lynne here. 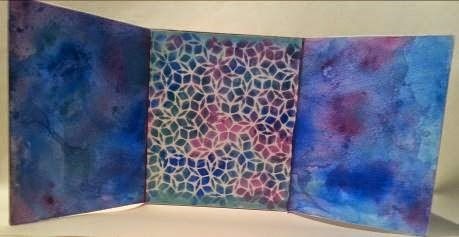 I am back with a journal page spread for you to try. Naomi and I haven't chatted in a while so we didn't know we were using the same stamp set for our October projects. I guess it shows how much we both love the Sara Naumann stamp sets. They are so versatile and adaptable. 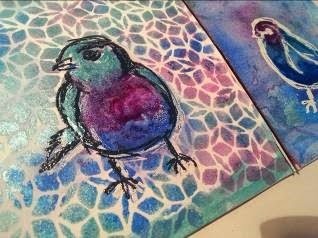 I have also used some of the new Jofy Paper Artsy Fresco paints and a stencil by Crafter's Workshop, which has just become my favourite! I'm working a small journal with loose pages. It's loose because it fell apart! I will bind together when all the pages are finished. Each page measures 20cm x 14cm. 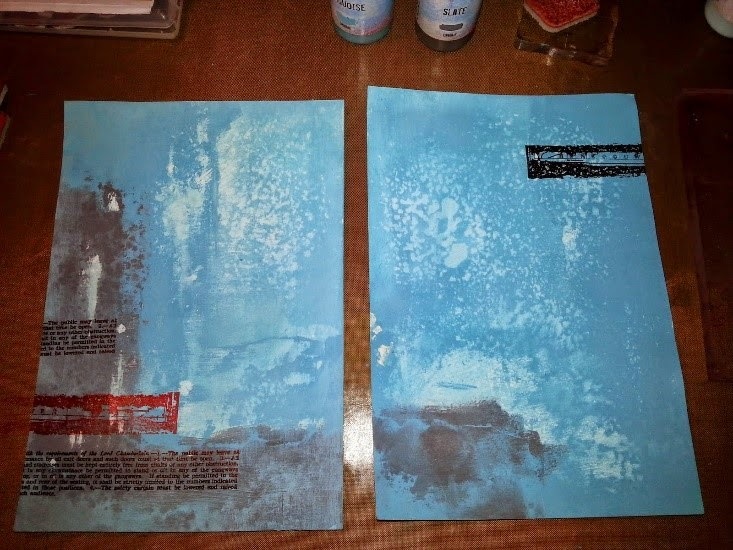 Anyway, start by applying gesso lightly to the two journal pages that will become your spread. 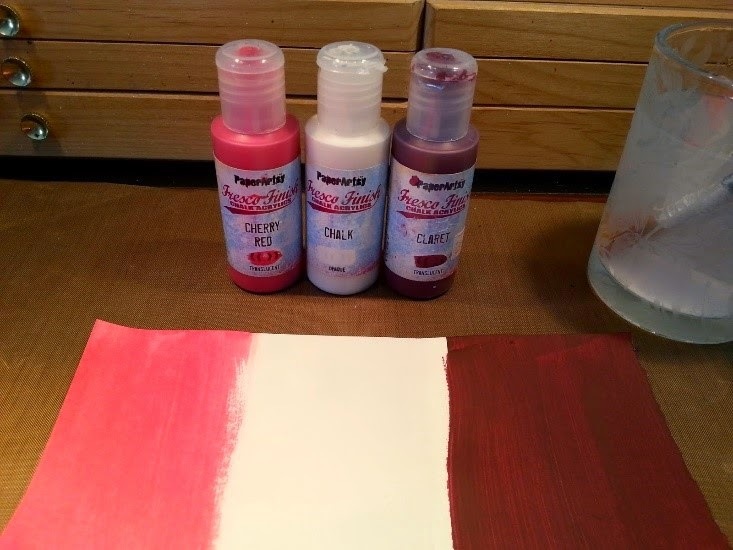 On an extra piece of journal paper, paint some swatches with Cherry Red, Chalk and Claret. Yes, Claret not Plum that is in the set. I think Claret works better for this project. 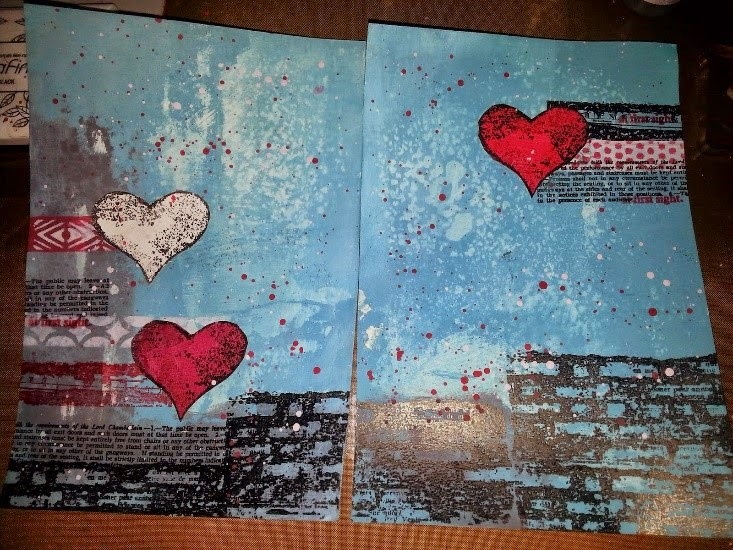 Stamp the hearts from Paper Artsy ESN11 with Versa fine Onyx Black on each of the painted backgrounds. 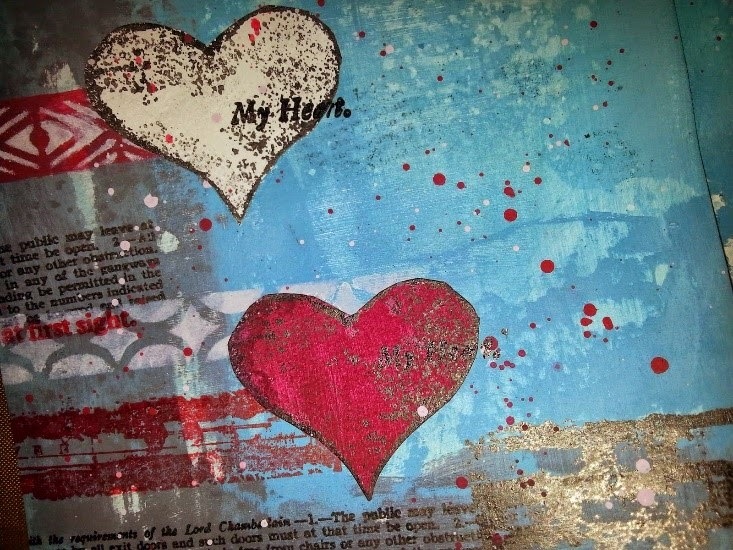 ...and fussy cut the small hearts. Set aside for later. 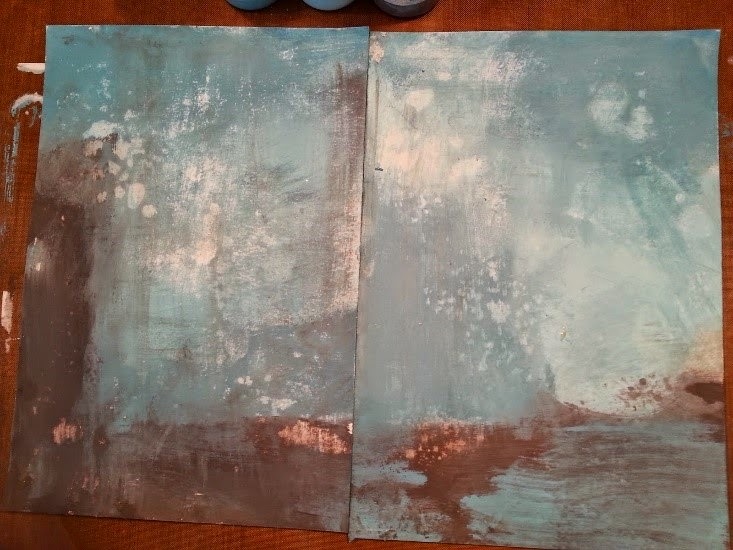 Back to the journal pages.With a brush apply Slate, Turquoise and Mermaid in the places shown. 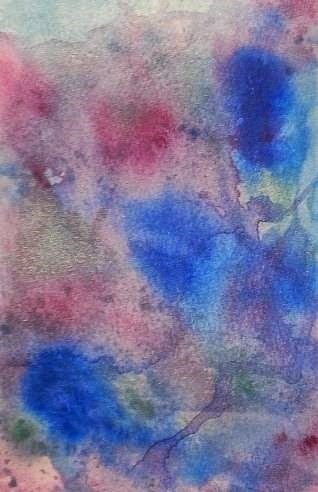 Work quickly and use a baby wipe to blend the colours into each other. Spray lightly with water and leave for a minute before wiping the water away gently with a clean baby wipe. You should have lighter speckled areas where the water was sitting. Now for some more fun! 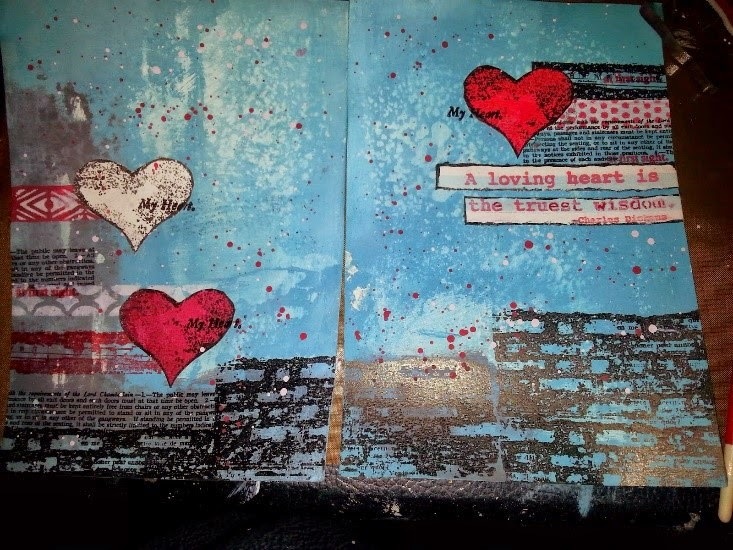 Stamping, I used the text from Paper Artsy ESN12 stamp set and the grungy 'whatever-it-is' at the bottom of the Paper Artsy ESN11 stamp set with Archival ink Carnation Red and Versafine Oynx Black as shown here. And my new favourite stencil! 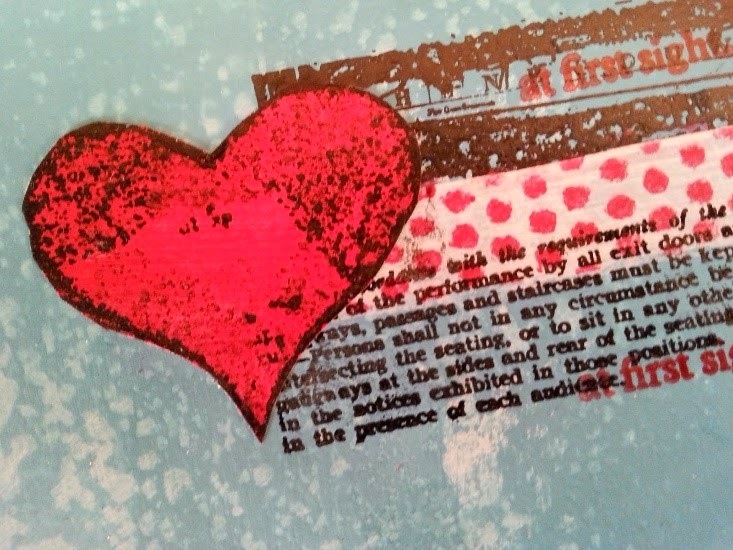 For the red on the left hand page I used the plain strip stencilled with Paper Artsy Fresco Cherry Red and also for the white with dots, I used the plain strip stenciled with Paper Artsy Fresco Chalk and the dot strip with Cherry Red. 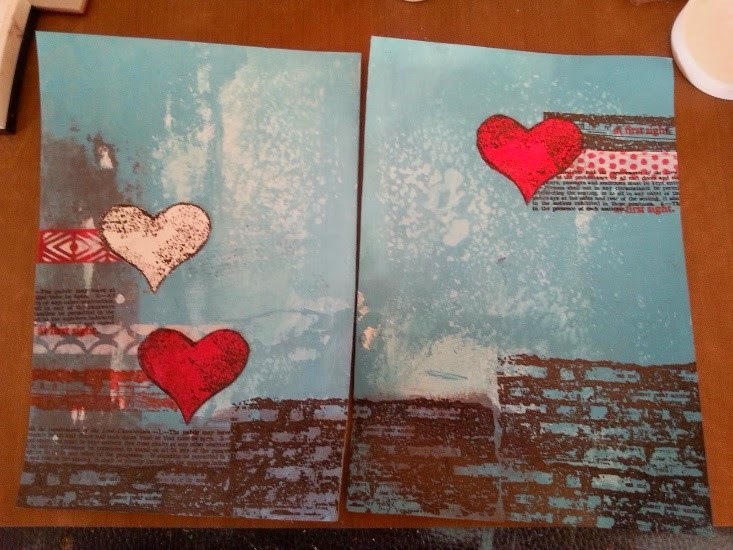 In the photo below you can see on the left hand page I went over the red strip with Chalk stenciled through another design from the stencil. Now for a few Cherry Red watered down splatters and a few Chalk ones for good measure. 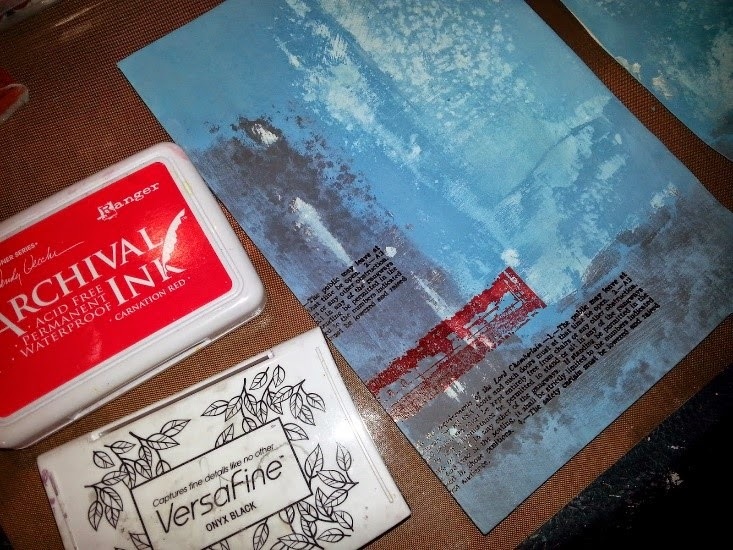 On a small piece of journal paper paint a strip of Mermaid and when dry, stamp the quote from ESN11 in Carnation Red. Ruler tear around the words and paste in place. 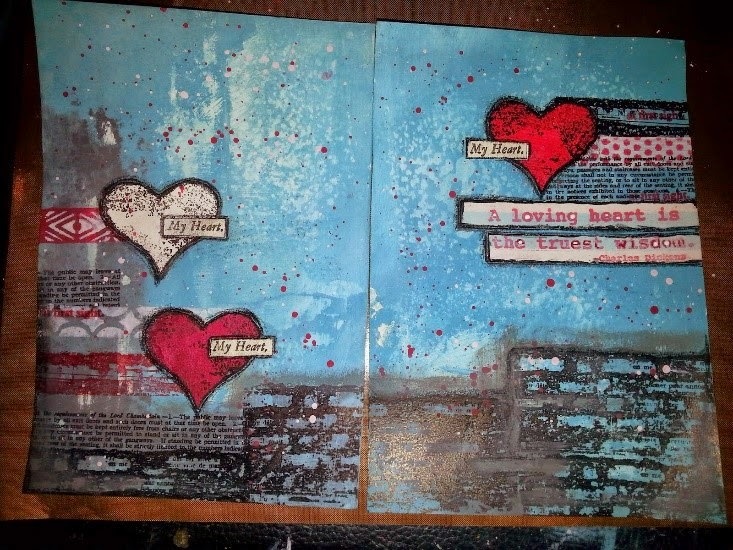 ......so, I stamped it on white journal paper and ruler tore it out and placed it with glue medium over the top. Much better. Finish off by softening around the hearts and texts with a black charcoal pencil. I hope you try this project or at least one of the techniques. 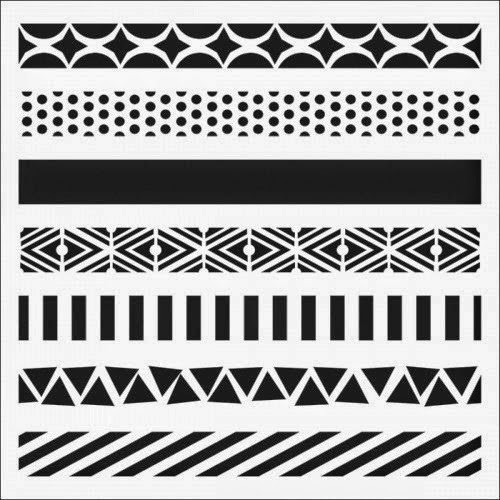 These stamp sets work so well together and can be used for many projects. Enjoy! Hi crafters its Naomi here with a fun Icad to share with you. 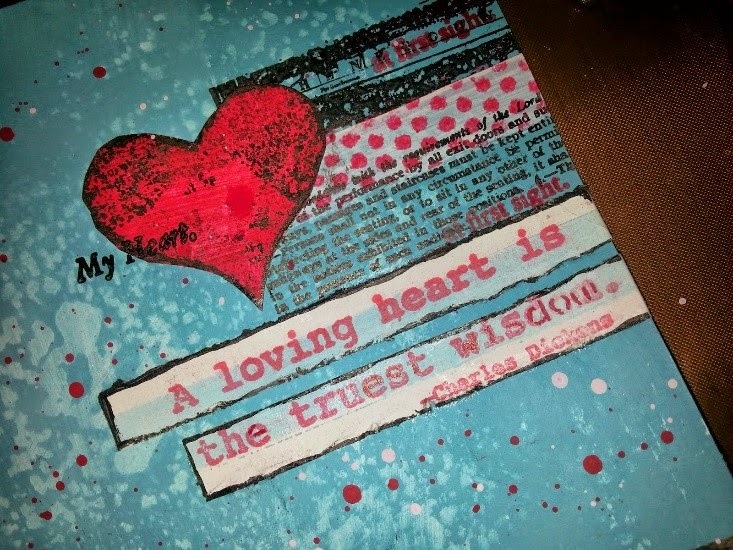 Icad's are so much fun and a great way to experiment and try new things. I have been hanging out to play with this new Sara Naumann Eclectica stamp set so I decided to make a quick Icad to try it out. 1. I stamped the script stamp in 2 of the corners with archival ink. 4. 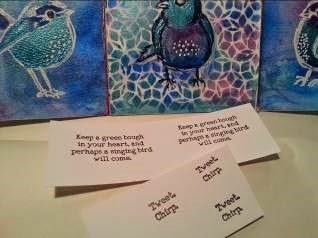 I added some extra stamping to the background then stamped the phrase onto card and cut up before glueing it down using gel medium. 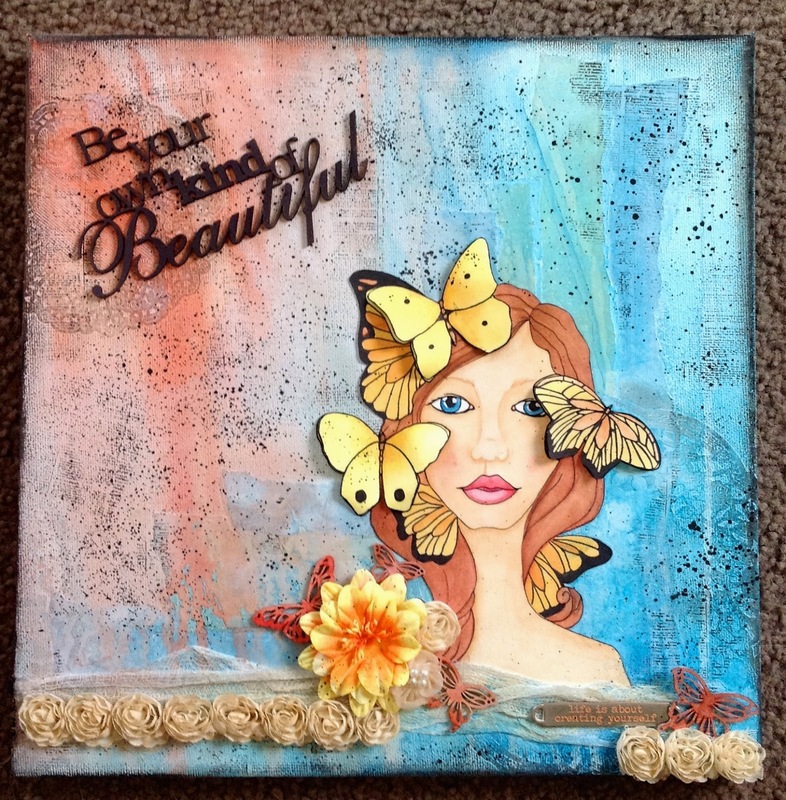 I hope you have enjoyed this little tutorial and you are inspired to give Icad's a try. Lynne here with another project for you to try. 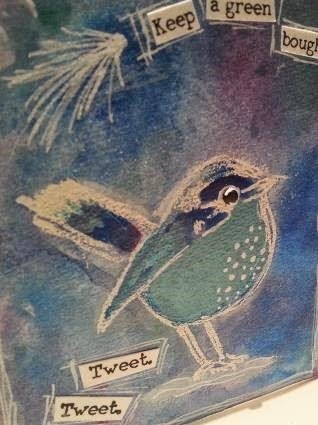 My friends know that I love birds, especially little ones like these Dina Wakley’s Scribbly Birds. This triptych was a lot fun to create. I love the way these acrylic inks can be diluted and used like watercolours and they can also be dripped on with the built in eyedropper for rich luscious coverage. Why not try out this project or something similar? Grungeboard rectangle scored into thirds. 1. 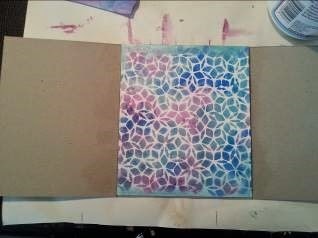 Spray watercolour paper (enough to cover two panels) until it is wet and drop on the three colours of Izinks. The colours should move and blend. If you need to, add more water and agitate with a wet brush until you get the effect you want. 2. 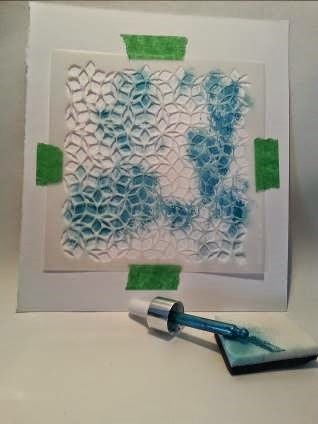 Tape the Artistcellar Quasi stencil to a piece of watercolour paper. 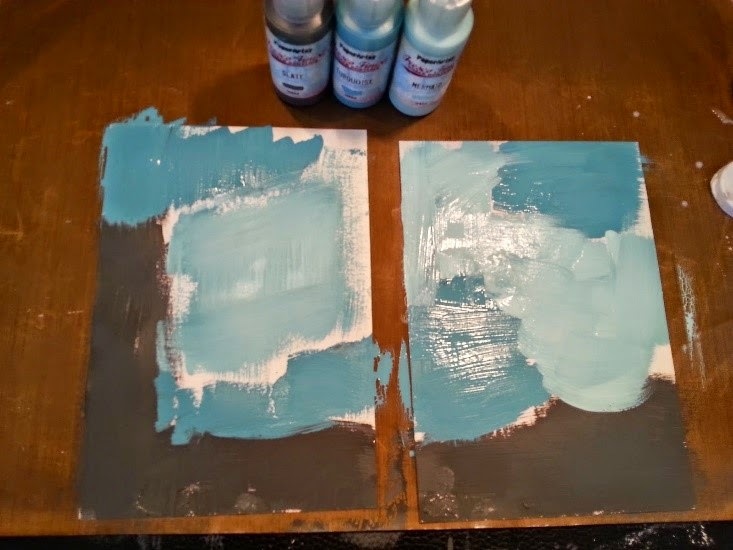 Use the white side of a piece of Cut ‘n’ Dry and with one colour Izink lightly applied to the foam, dab through the stencil in a few places. Repeat with the other two Izink colours until the whole stencil design has been created. 3. Remove the stencil carefully. This stencilled watercolour paper needs to be cut to size to fit into the centre of the triptych. Colour around the edges with one of the Izinks and water if needed to fill any gaps. 4. Cut to size and adhere to centre panel with matte medium. 5. Cut the other two panels to size and adhere them also. 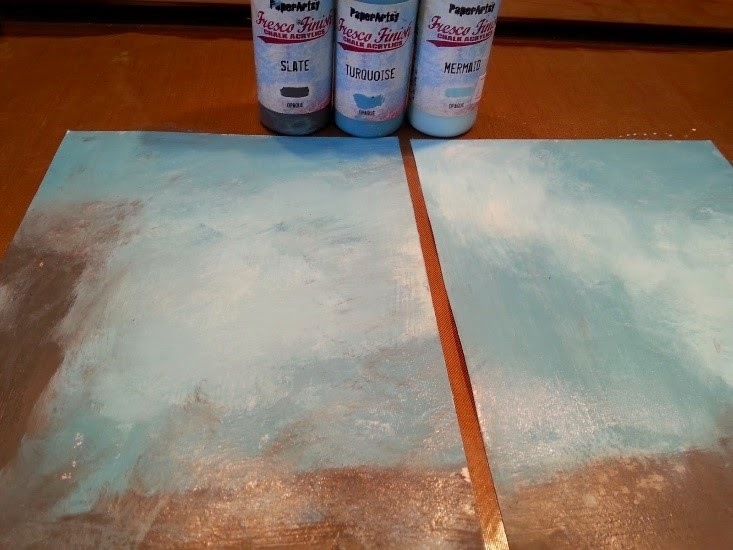 I like to use a piece of sandpaper around the edges to make everything smooth and neat. Your triptych should be able to stand alone. 6. 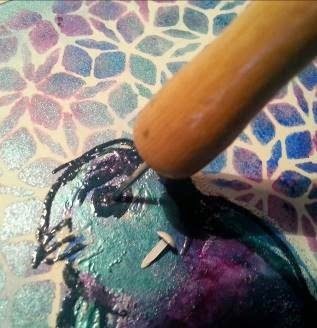 Stamp one bird on each panel using the Versamark stamp pad, add white embossing powder to outer birds and navy to the centre bird and heat set. 8. Add some mini brads to the eyes. 9. Use a white Sharpie to add some outlines and some dots on the birds’ breasts and on the centre bird’s beak. 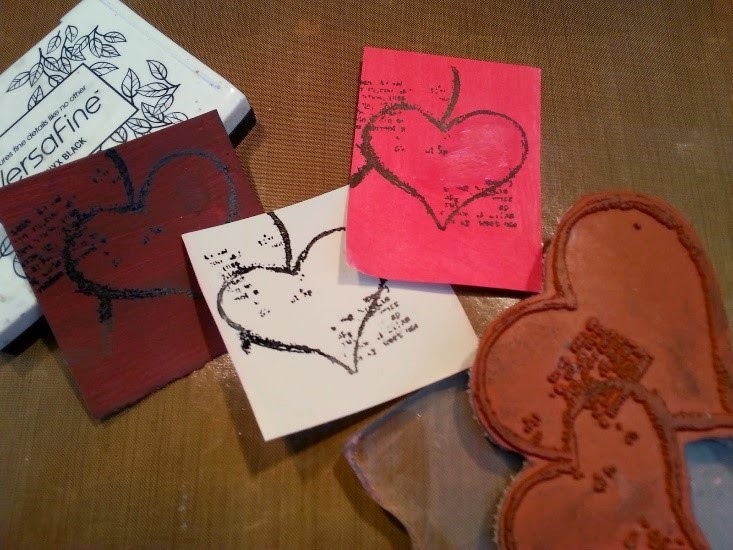 Stamp the text on watercolour paper using a black stamp pad. Cut out the words and arrange them. Then adhere them with matte medium. And we are nearly done! 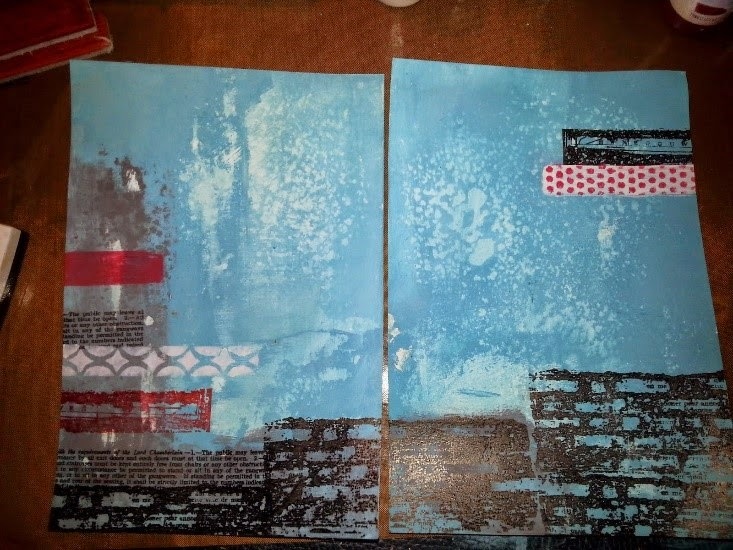 I covered the back of my triptych with coordinating scrapbook paper. We are very excited to be introducing a monthly challenge for you all to play along with. There will be a great prize of a $20 voucher to spend in-store for the lucky person whose entry is chosen as the winner by the DT team. It is very simple to take part, all you have to do is make a project that follows the chosen topic and upload using the link tool at the bottom of the post. You can find all the rules and guidelines at the bottom of this post. 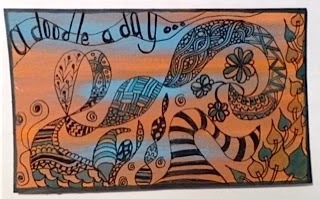 Blue and Orange - make a piece that showcases blue and orange as the main colours. We hope you have fun creating and can't wait to see your entries! All entries must follow the chosen topic for the challenge entries that do not follow the topic will not be considered for the prize. You can enter any kind of paper craft to be eligible for the prize. No back linking is permitted entry must be new and not entered into no more than 2 other challenges. The InLinkz link up tool will close at 23:55 (Australian Eastern Standard Time) on the last day of the month with the winner announced on the blog on the 5th of the following month. The DT will vote to decide the winner of each challenge and their decision will be final. The voucher will be emailed to the winner and can be used via the website or shop.